City beautification is important for a variety of reasons: not only does it make a downtown area and city streets and centers more welcoming to the community, but it also increases tourism, has a positive affect on property values, and has been linked to a decreased crime rate. Urban planning and development often includes looking for ways to keep cities and towns more safe and appealing to tourists. To that end, here are a few simple yet effective ways to instantly beautify your city streets, centers, and neighborhoods. 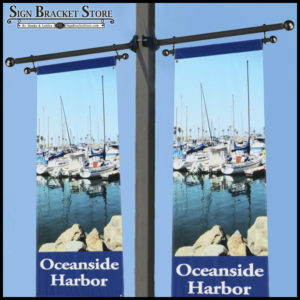 Find sign brackets and pole banner brackets that match your city’s architecture—whether traditional, ornate, or modern—to give your city a refresh without more major construction. Not only do decorative sign brackets bring attention to signs and banners, but they also give the area a cleaner, more streamlined look. 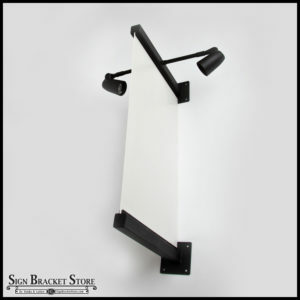 For example, our Decorative Scroll Banner Bracket Wall Mount has an artistic scrollwork pattern that is both decorative yet simple enough to switch out banners easily. Our more modern blade sign brackets, like the Universal Straight Arm and the Terazza, are ideal designs for complementing more metropolitan downtown areas with a lot of industrial-style architecture. 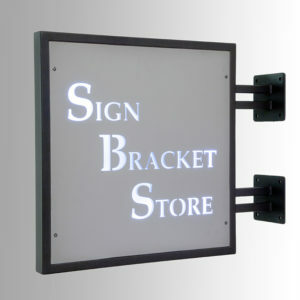 Lighted sign brackets, with an illumination source built into the sign bracket, are also available at Sign Bracket Store. From traditional designs like the Classic Lighted Sign Bracket to contemporary styles like the Montamar Lighted Pair Kit, there is a style for every application. Choose from designs that light both sides of the sign or backlit sign panels with a custom cutout design of your choice, which is then backlit from within the sign. Create a cohesive look—in other words, give your city a “personality” that is all its own—with pole banners to highlight seasonal and local events and major tourist attractions. 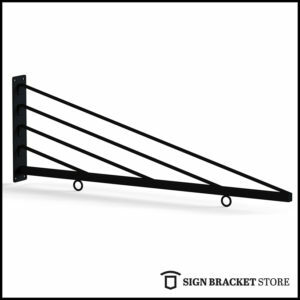 Choose from one or two-way banner brackets, and lighted brackets are also available for optimal visibility. Our trapeze banner brackets specifically hold banners taut and prevent banners from bowing in wind and rain. Add in some natural beauty with beautiful, commercial-grade hanging flower baskets popping with the colors of seasonal flowers. 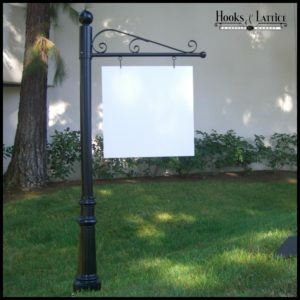 We’ve combined the best of both worlds with our Lamp Post Banner Bracket Set with Hanging Basket. 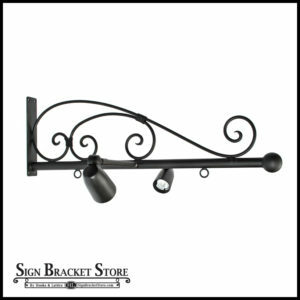 This eye-catching bracket/basket combo can be attached securely to any lamp post or wall with the hardware included. 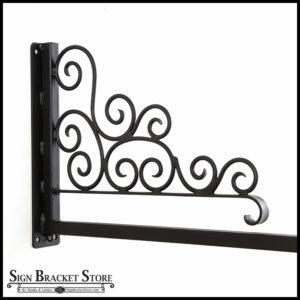 It will hold a banner taut and wrinkle-free, and is made of powder-coated, rust-resistant wrought iron in an intricate scroll design. The hanging basket, also made with the same weather-resistant materials, includes an all-natural coconut coir liner, and is available with the option of a fiberglass insert or water reservoir, which keeps plants hydrated longer (and maintenance costs down). Whether it’s lamp posts, sign lights, or directional lights that highlight a statue or artwork, lighting is a huge part of a city’s appeal. Not only does it draw attention to important things, but it also increases security due to the added visibility. 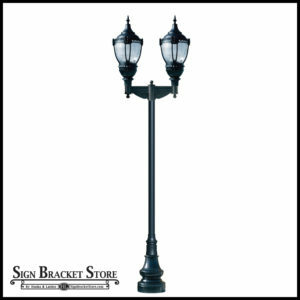 Decorative lamp posts like our Vintage Look Dark Sky Lamp Post have Old World charm and are perfect for historical downtowns where this lamp post will fit in, and yet stand out, with the surrounding architecture. Another ornate lamp post option is our 3-Lamp Globe Light, which has an Art Deco style that gives it a timeless look. For city streets with a more modern or industrial style, our Modern Post Light Fixtures have a chic, streamlined shape that work well. 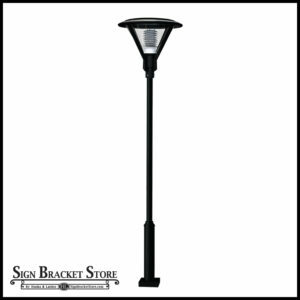 This sleek, simple lamp post gives off a warm glow that is ideal for increasing nighttime visibility, without glowing too glaringly, in neighborhoods and parking lots. If you’re looking to increase nighttime visibility without contributing to light pollution with too-bright lighting, all of our Dark Sky lamp posts minimize upward light projection and glare with their fully shielded blue lights that illuminate without glowing too brightly. 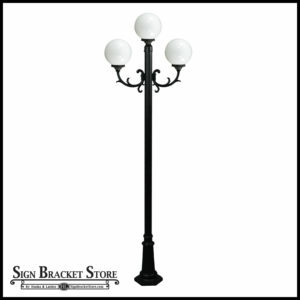 In historic districts and quaint tourist areas, our elegant sign posts are the perfect way to create symmetry in your street style. With every business on the street displaying a distinctive, elegant post like our Aluminum Torino single post system for their shop’s signage, visitors will love this little detail. 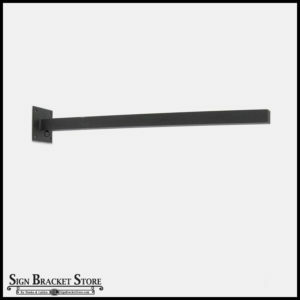 Powder-coated wrought iron sign posts are made to withstand the elements with ease, for beautiful signage that lasts years. These lovely sign posts can also be used for wayfinding, so that tourists from far off places can easily find your city’s hottest attractions, contributing to a more overall positive experience. From banners to signs to lamp posts—and much, much more—we have a variety of commercial-grade products perfect for your city beautification project. 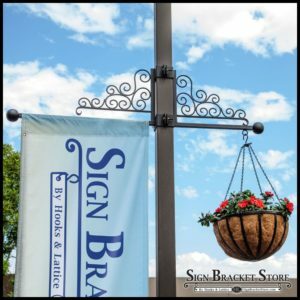 With contemporary and traditional styles, functional designs, and high-quality materials, Sign Bracket Store offers everything you need in one place. Call us today at 1-888-919-7446 to place your order!